On the seventh day God rested, so Sunday dinner was up to Lucifer. While chewing enthusiastically and explaining to his angels that, for much of the beginning of human history, his most confusing creation would believe their planet was not only flat but the center of the universe (to hearty chuckles all around) God ate in contentment. But, towards the end of the meal, the creator abruptly began to brood. Seeing his lord staring off, his hairy jaws full but no longer moving, Gabriel asked what was wrong. “Oh, I did I burn it again?” Lucifer asked. More laughs around the picnic table stretching across the clouds. God dropped the bone, still sporting a bite or two of glistening meat and dribbling pink juices, to his plate. It clattered down the pile of a half-dozen others, all scratched white with teeth marks. He pushed the plate away. “Well, it’s too late to make it up to Adam now,” Lucifer remarked, trying to laugh off the unexpectedly heavy mood and pointing to the blood-stained cooler by the grill. God, however, would not be moved. “No more meat,” he proclaimed, rising from the table and scrubbing his mouth. The angels stared at one another. The creator’s new diet, however, was harder to maintain than he expected, and he often cheated. God was at times surprised, if not embarrassed, at his own taste for flesh. Scattered crumbs of minced Eve-and-forbidden-fruit pie littered the refrigerator early one morning. Half an Abel wrap was discovered in the crisper, hidden under an untouched bundle of kale. When confronted, God shrugged off his inconsistent culinary convictions as trivial. Later, alone and racked with guilt, the heavenly father would swear off meat for whole days at a time. But these bouts of nearly-zealous vegan fervor only ended in gluttonous splurges. The discrepancy began to irritate the angles, especially Lucifer, who possessed not only a passion but a real knack for cooking. But what was safe to prepare? When a long meat-abstinence triggered a craving for stew in the creator, God would nearly drown the earth in order to sate his greedy hankering, and Lucifer scrambled to fill the largest pot he could find. Yet forty days later, just as the devil finished packing the freezer with god-only-knows how many meticulously labeled Ziploc bags, God insisted the entire store be disposed of, thrown out as unclean. Another long gastronomic sabbatical ended with the roasting of two whole cities. “At least watch your sodium,” an alarmed cherub begged, winching as the boss dashed a second and then third sprinkling of Lot’s wife over his plate. Meat was proclaimed taboo once more, but the very next day God bought himself a jerky dehydrator. He claimed it was for preparing home-made raisins and banana chips, but instead of the smell of dried fruit, it was the tangy odor of Job, slowly curing, that soon hung in the air. In frustration, Lucifer quit heaven to open a restaurant, which, to God’s chagrin, became appallingly popular. A diet of sinners, carefully portioned with whole-grain, fruit, vegetables and plenty of water in-between meals kept God’s formerly-favorite cook in fine shape—a condition Satan himself attributed equally to a lack of agitation. “If you’re constantly stressed over what you eat, you wind up eating exactly what stresses you out,” the restaurateur told his customers with a wink. He also made no secret that he would love to treat his old employer to an evening of elegant, health-conscious dining, on the house, just to bury their past. God (himself more and more noticeably overweight despite his repeated condemnation of meat products) ignored the invitation and tried to denigrate his ex-friend’s business whenever the topic came up. He picked at little things—claiming the building’s thermostat was kept too high, for example. Meanwhile, God began to spin downright wild rationalizations to sanctify his untamable appetite. God reached his might finger down and squeezed his limitless spirit into a tiny, squalling body swaddled in a feed trough. His gaze lingered on the human parents to his meaty, fostered child, feeling only good will towards man and no, not one ounce of hunger. But when three kings and a group of shepherds crowded into the stable, the Lord’s mouth began to water. God shivered and pulled his trembling hand back into the clouds—but opened his fist with a groan. He had, without quite meaning to, snatched up a generation of Hebrew first-born sons from Herod’s kingdom. Only the promise he made to himself that this was absolutely the last time he would consume babies (they had never set well in his belly anyway, those Egyptian newborns of Pharaoh’s nation, and later, the infants his conquering Israelites tossed from the fortress walls of the Samarians and Midianites, from the watchtowers of Amalek and Babylon) allowed God to eat without feeling too guilty. Thirty years later, the devil came to Christ in the desert, to invite him to dinner. Satan could reserve a table for parties of twelve or larger any time, no waiting. And the Passover special: disciples eat free. God, in human form, turned stoically away. Still, the offer hung in his mind. Reservation taken care of. No waiting. Now, that was service. Hoping no one would recognize him, God crept through the doors of Satan’s establishment, intending to order a simple dish, perhaps just a salad. But, after being seated and welcomed personally by the owner, God began to feel more and more humiliated. Did Lu’ have to grin so broadly and greet him so loudly? The occupants of the surrounding tables were staring. God considered standing up and walking out right then. 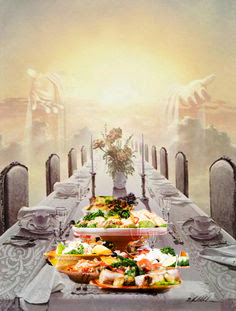 Instead, in a revelation of spitefulness, the Lord decided to order the most complex dish he could imagine: himself. Without a moment’s hesitation, not even a blink, the host dismissed himself to the kitchen to prepare the meal personally. God sipped his ice water and smirked to himself. Let the arrogant upstart cook that! He would fail, of course, emerge from the kitchen, humbled, and beg to return to his old post. Yet, as he stabbed a lemon wedge underneath the ice chips in his glass with his knife, doubt crept into God’s mind. He heard his fellow diners whisper over their plates, but he could not make out the words. Had this challenge been a miscalculation? Had his hunger, once again suppressed to the point of reason-obliterating craving, clouded his better judgment? Of course he wouldn’t eat a thing—even if anything was placed before him, which was unlikely. But, just as a precaution, God deftly removed his fork and spoon, still wrapped in the immaculate cloth napkin, from the table and hid them along with his knife inside his billowing, white robe. As if upon cue, his cook marched through the double swinging-doors of the kitchen in a cloud of savory steam, carrying a covered, silver tray. A heavy, sweet odor followed. God, his dish before him but no cutlery at hand, found himself gripping the thin, soft cut of flesh with his large fingers. As if in a dream, he closed his eyes and took a bite. A jab of pain broke this trance before it could even settle in. The delicate slice of meat had slipped through God’s hands and lay on the floor. He had knocked over his water. The horizontal parentheses made by the bite-mark on the side of his right index finger stared back at him. Before returning to Paradise and locking the door behind him, God stopped to devour Stephen with such voracity as to nauseate even the hereto iron-stomached Saul. How thankful he was for the conscience-muting grogginess, even if it was accompanied by that all-too-familiar swollen feeling extending from his gut right up to the back of his throat. Jason Howell studied print journalism at the University of North Carolina, Asheville, and earned a bachelor’s degree in mass communication in 2011. He's currently a social worker and before that worked with the disabled. He and his son live in the small town of Burnsville, North Carolina. He writes, J.K. Rowling-style, after working and reading to his son before bed every night. However, with respect to Rowling, he admits that’s the extent of his similarity to any author of magical adventures that assure the reader that good always wins.